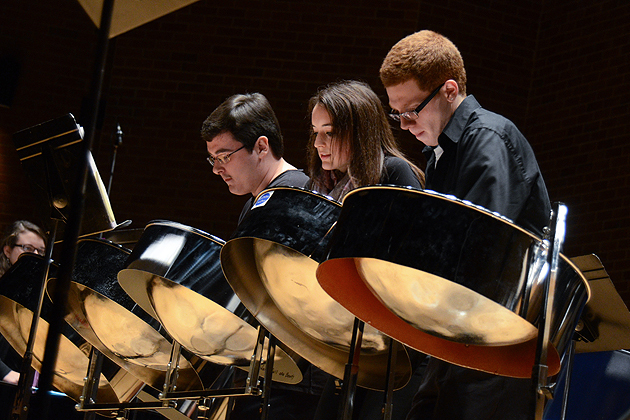 If music is a universal language, then UConn’s steel pan ensemble provides an exclamation point. This group is made up of 14 students representing a wide range of majors, cultural backgrounds, and musical expertise. They’ve come together to master an art form that has its roots in the culture of the Caribbean, first as Tamboo-Bamboo (using tunable sticks made of bamboo) and then, with the inclusion of items such as spoons, bottles, and assorted pieces of scrap metal, evolving into the music known as Calypso. Thanks in large part to its location in the middle of World War II shipping lanes, the island Republic of Trinidad and Tobago in the southern Caribbean found itself with an abundance of used 55-gallon oil drums during the 1940s. Local performers quickly identified their potential as instruments and the art of tuning these ‘steel drums’ vastly expanded the range of musical possibility; steel drums became the instrument of choice. Luci Chaplin ’13 (CLAS), a double major in psychology and human development, first heard UConn’s steel band when she came to an open house for new students. With a musical background that includes mastery of the flute, piano, and tenor sax, and experience performing in both the concert and jazz bands at Lyman Memorial High School in Lebanon, she was immediately drawn to the intricate rhythms and harmonic overtones inherent in the music. The ensemble performs under the guidance of Robert Stephens, professor of music in the School of Fine Arts and a specialist in world music and music education. 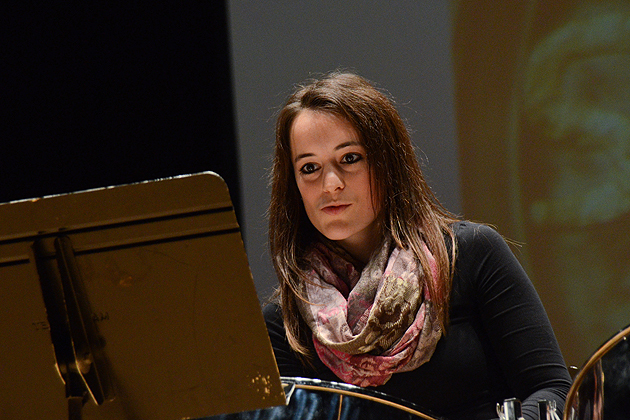 Although not officially sponsored by the music department – the group is funded in part by the Student Government Association – the ensemble benefits from Stephens’ expertise in the culture and sounds of the Caribbean.